It seems no matter who John Wall has in the line-up the past few games, he has found a way to help him get the support he needs to win games. Tonight, he did it again against a solid Memphis Grizzlies team who never seemed to find their perfect line-up. 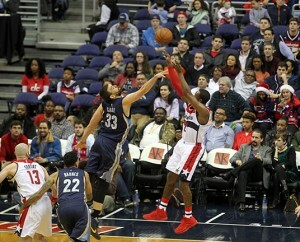 Wall had 14 points and 14 assists to help the Washington Wizards beat the Memphis Grizzlies 100-91 on Wednesday night. 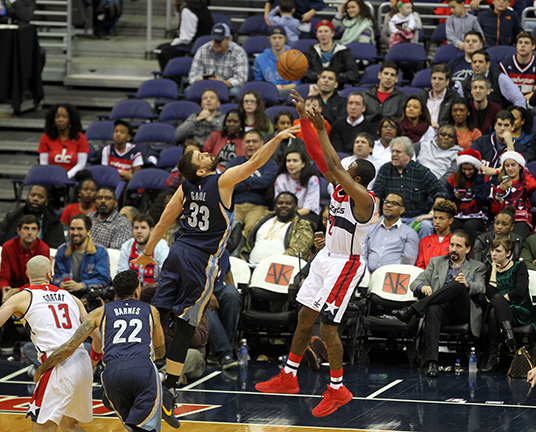 This was Wall’s fourth consecutive double-double and the Wizards have won three games. Memphis also saw its two-game winning streak end even though Washington coach Randy Wittman again could use only nine players. For the Grizzlies who played last night in Philly, the combination of having Mario Chalmers ejected from the game and the inability to get the game under eight points late the fourth quarter gave the Wizards all they needed later to build the lead back to double digits with under 2:00 remaining in the game. Prior to the start of tonight’s game, Washington signed guard/forward Jarell Eddie and waived center Ryan Hollins on Wednesday. Eddie was averaging 14.1 points in 11 games with Austin of the D-League this season. Hollins was signed on Nov. 30 and played in five Washington games, averaging 1.6 points. …The Wizards had five players out with injuries, starting with Bradley Beal and Otto Porter. Gary Neal missed Monday’s win but he made it back for this game, scoring five points.